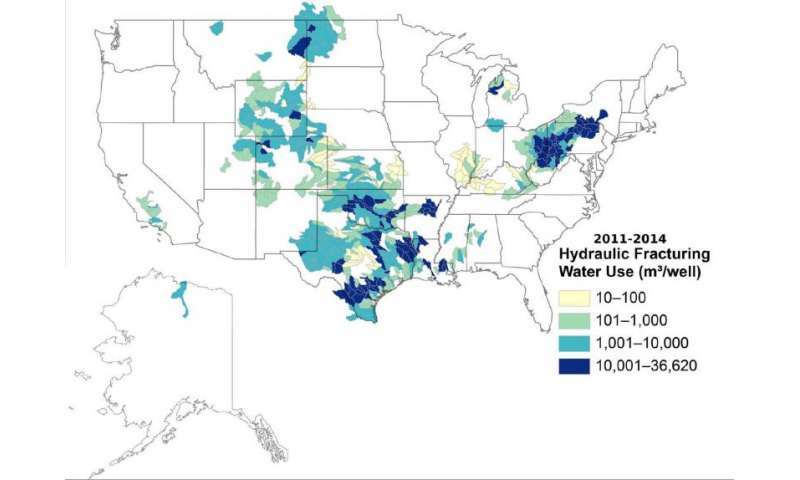 The amount of water required to hydraulically fracture oil and gas wells varies widely across the country, according to the first national-scale analysis and map of hydraulic fracturing water usage detailed in a new study accepted for publication in Water Resources Research, a journal of the American Geophysical Union. The research found that water volumes for hydraulic fracturing averaged within watersheds across the United States range from as little as roughly 9,800 liters (2,600 gallons) to as much as 37 million liters (9.7 million gallons) per well. In addition, from 2000 to 2014, median annual water volume estimates for hydraulic fracturing in horizontal wells had increased from about 670,000 liters (177,000 gallons) per oil and gas well to more than 15 million liters (4 million gallons) per oil well and 19 million liters (5.1 million gallons) per gas well. Meanwhile, median water use in vertical and directional wells remained below roughly 2.5 million liters (671,000 gallons) per well. For comparison, an Olympic-sized swimming pool holds about 660,000 gallons. "One of the most important things we found was that the amount of water used per well varies quite a bit, even within a single oil and gas basin," said Tanya Gallegos, a scientist at the U.S. Geological Survey in Virginia, and the study's lead author. "This is important for land and resource managers, because a better understanding of the volumes of water injected for hydraulic fracturing could be a key to understanding the potential for some environmental impacts." Horizontal wells are those that are first drilled vertically or directionally (at an angle from straight down) to reach the unconventional oil or gas reservoir and then laterally along the oil or gas-bearing rock layers. This is done to increase the contact area with the reservoir rock and stimulate greater oil or gas production than could be achieved through vertical wells alone, according to the study's authors. However, horizontal wells also generally require more water than vertical or directional wells. 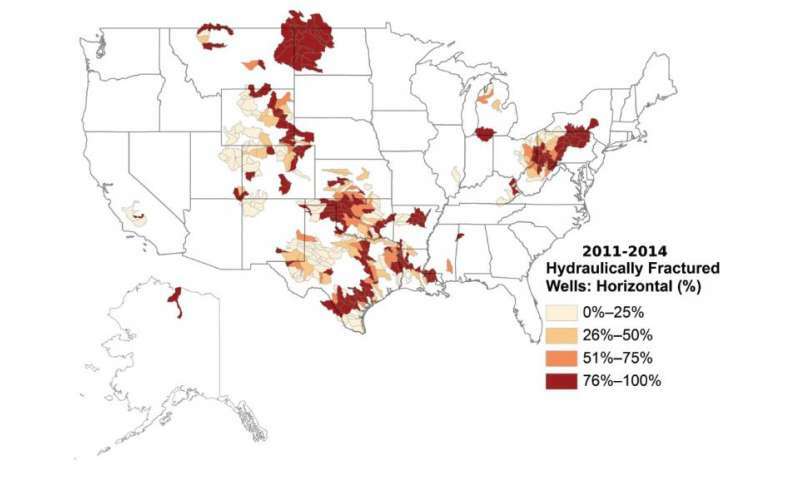 In fact, in 52 out of the 57 watersheds with the highest average water use for hydraulic fracturing, over 90 percent of the wells were horizontally drilled, according to the new study. Although there has been an increase in the number of horizontal wells drilled since 2008, about 42 percent of new hydraulically fractured oil and gas wells completed in 2014 were still either vertical or directional. The ubiquity of the lower-water-use vertical and directional wells explains, in part, why the amount of water used per well is so variable across the United States, according to the study's authors. Shale gas reservoirs are often hydraulically fractured using slick water, a fluid type that requires a lot of water. In contrast, tight oil formations like the Bakken (in parts of Montana and North Dakota) often use gel-based hydraulic fracturing treatment fluids, which generally contain lower amounts of water, according to the study's authors. This research was carried out as part of a larger effort by the USGS to understand the resource requirements and potential environmental impacts of unconventional oil and gas development, the study's authors said. Prior publications include historical trends in the use of hydraulic fracturing from 1947-2010, as well as the chemistry of produced waters from hydraulically fractured wells, the authors said.